Ticia, over at Adventures in Mommydom, tagged me with a bunch difficult homeschooling questions, as part of a homeschooling meme, going around our little corner of the blogosphere. There are nine questions, and then a chance to pass on the fun to a fellow homeschooler. My answers, such as they are, are below. I should warn you, I'm in a funny kind of mood, feeling buried under piles of books, and maybe just a little more weary than normal for the "start" of a year. I'm sure my answers reflect that, and might be entirely different next month, or the month after that. 1. One homeschooling book you have enjoyed. I have enjoyed a number of homschooling books, but Rebecca Rupp's Home Learning Year by Year, How to Design a Homeschool Curriculum from Preschool Through High School is one I return to year after year, and have loaned out to friends, and recommended on multiple occasions. Not only does it include a detailed list of the academic skills a child should master each particular year (using public school as a model), which is fun to compare against, and check off every so often, but there are countless book recommendations, and website lists to follow up with, too. Even last night, flipping through the book for the umpteenth time, I found a new list of websites (most of which are still around), to check out, and a few more books to put on hold at the library. 2. One resource you wouldn’t be without. I'd have to say, the public library. I use it so much, I'm surprised they haven't asked me to volunteer hours while I'm there. The Internet comes in a close second. There are times though, when I wonder if I didn't have it, if I couldn't use my time more wisely - less researching, more teaching/playing/reading with the children. 3. One resource you wish you had never bought. I was going to say the Real Science 4 Kids series by R.W. Keller, Ph.D. except that doesn't seem entirely fair to the author, or the series. 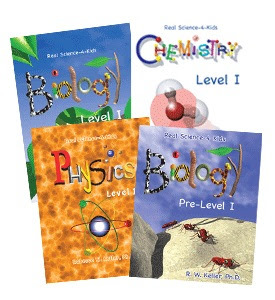 It is a very good science series, with good workbooks, teacher texts, and experiment suggestions. It just hasn't been as good a fit for our family, as I had hoped. Really, it would probably be closer to the truth to say I wish I hadn't bought any new resources, at all, for the last few years. When it comes right down to it, one resource is pretty much the same as the next, they all have pros and cons. Sooner or later, you have to stop searching for the perfect book, program, kit, or game, and just teach the material. If most homeschoolers are honest with themselves, they probably already have enough resources currently in their closets and cupboards, that with the addition of what is available for free on the Internet, and at the library, they could easily cover K-12 without buying anything other than essential supplies, and perhaps a few additional tools, as the children grow. 4. One resource you enjoyed last year. Our family membership to an Association of Science-Technology Center museum, which allows us free access to science and technology museums across the country. 5. One resource you will be using next year. My own bookshelf. There are so many great books, DVDs, CDs, and CD-roms just sitting around our house waiting to be explored. I'm determined to make better use of all the information already around us. 6. One resource you would like to buy. Again, I hope to buy very little this year. With that said, I wouldn't mind buying a new globe, telescope, or microscope. But, then again, if I look hard enough I might be able to find those resources available at some of the great science and technology museums across the county we have membership access to - so, maybe what I'd really like is just a lifetime supply of printer ink, and some pencils that will sharpen without shredding. 7. One resource you wish existed. I wish more children's books were available in electronic format. Our library has a growing selection of e-books, and audio book downloads, but I wish the entire catalogue was available that way. 8. One homeschool catalogue you enjoy reading. I enjoy reading them all, but try to avoid them whenever possible. 9. One homeschooling website you use regularly. BrainPop.com - it's the only subscription site I've been willing to renew for more than one year in a row. I like to be able to find easy to understand, funny, little videos to go along with almost any topic we happen to be interested in. BrianPop usually has what I'm looking for. They always have a selection of rotating, free, featured videos, too. So, even if you don't want to pay for a subscription, you might want to check them out from time to time. It's great to be a homeschooler (even when you're feeling tired and introspective). I hear you on #5. We haven't been homeschooling long and I keep finding myself caught up in all the potential things to buy...but then look around and see all the excellent resources in our home. So true about the books that are already at home plus the library, of course. There are so many things that one could buy and difficult to know what will end up being used and reused. The start of the year is wearisome- there always seems to be something more added to make life extra complex. I really liked reading this post and learning what your favorites (and not-so-favorites) are. I agree 100% about using the resources we already have, plus the library and the internet. We have SO much in our house already, too. I keep trying to tell myself that...books are truly my weakness! Brainpop is awesome. We don't have a subscription, but when I was looking for a good explanation of September 11th for my kids, their video was the best I found anywhere. Thanks for the list. I just put Home Learning Year by Year on hold at my library. And it's SOOOO hard not to buy those pretty shiny new things. I felt that way about the thing that was a miss for me. It's a good curriculum and a good product, just not for me. Even if I am not homeschooling, I find myself constantly tempted by things to buy (and sometimes giving in to this temptation). Great post. I agree with you on so many points. This is a great post, thank you! I just found your blog and am enjoying looking around.